This soup is a labor of love. It’s a process, with many ingredients and steps, much like this fantastic Cuban chicken soup. Is it worth it? Absolutely! 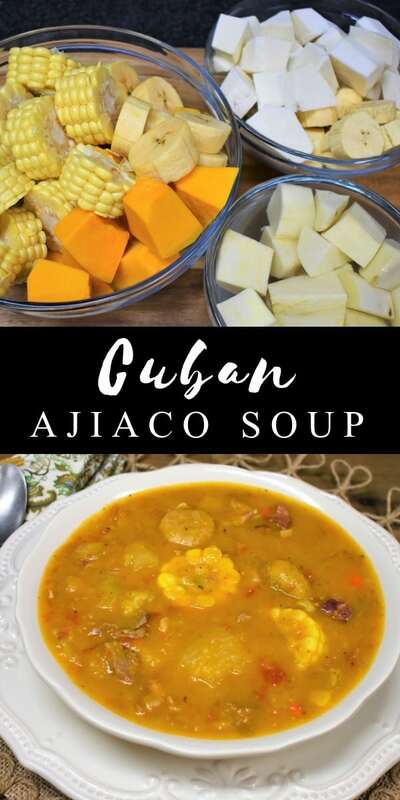 This recipe is a mostly traditional Cuban ajiaco. I say mostly because we don’t include tasajo, which is a common ingredient in ajiaco. Tasajo is dried beef. Like beef jerky, but it’s reconstituted with water prior to cooking. Tasajo has to be soaked in water overnight before using. A typical way to use tasajo is to cook it in tomato sauce with onions, peppers and spices. We don’t use tasajo in this ajiaco recipe because it’s a difficult ingredient for most to find. Instead, we use smoked ham shanks to get that salty, dry meat flavor and texture into the ajiaco. Ham shanks or ham hocks will be much easier to find. 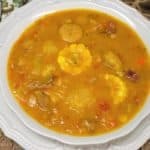 What else goes into a Cuban style ajiaco? 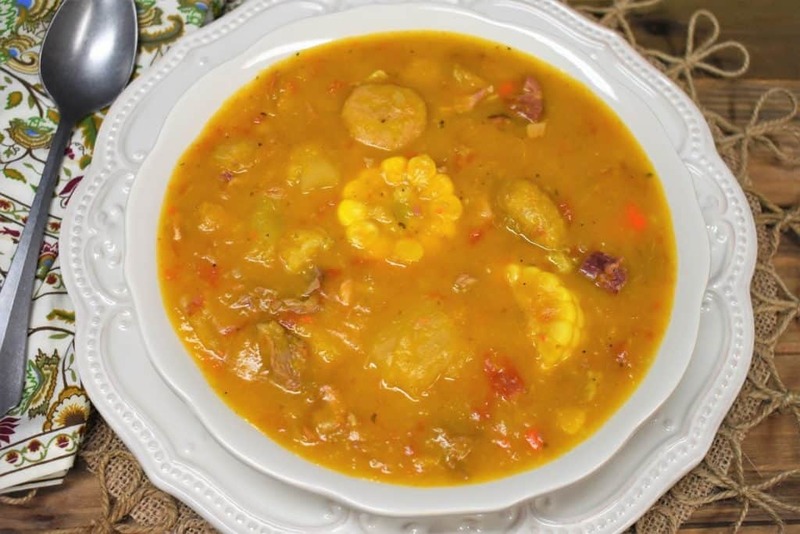 This hearty soup is made with root vegetables, pumpkin, plantains and corn. Let’s break them down. 1. Yuca, or yucca, is a root vegetable with a brown rough skin and hard, white inside. Yuca is boiled and served as a side dish at gatherings and special occasions. Yuca is traditionally served with mojo; they go together like a hand and glove, salt and pepper, rice and beans – you get the picture. 2. Malanga, also called malanga in English, is a brown, hairy tuber that has a white, fleshy inside. It has an earthy taste with a texture similar to a waxy potato. Malanga is used in stews, soups, as a mash or boiled and topped with a drizzle of olive oil as a side dish. A malanga puree is commonly used as a nutritious meal for someone who is under the weather. Platanos or plantains resemble bananas but they’re quite different. The main difference, you don’t eat a platano raw. But they can be prepared in several ways and at different levels of ripeness. 3. Platano Verde or green plantain – In their green state, these are usually are twice fried to make tostones. But they’re also used in soups and stews. 4. Platano Pinton – This is when the plantains are semi-ripe. They’re yellow in color with a few black spots and are usually used in soups or stews. Platano maduro, or ripe plantains are really popular in Cuban cuisine, and Caribbean cooking in general. At this stage the plantain is super ripe, the exterior is black. Typically they’re fried to make platanos maduros fritos, which are super sweet and served as a side dish. We don’t use them in this ajiaco recipe, but I thought they’re worth mentioning. 5. Boniato is a white sweet potato that’s a reddish, purple-ish brown color on the outside and white on the inside. It does have the sweet flavor that a sweet potato has, but not quite as sweet. It’s used in the same way, with soups and stews or mashed as a side dish. 6. Calabaza is pumpkin, use a baking/cooking pumpkin, not a carving pumpkin. And the last vegetable that goes into this soup is corn, which we’re all familiar with. Fresh corn is best for this soup. Heat the olive oil in a large, heavy bottom pot over medium heat. Add the onions and carrots to the pot. Gently cook the onions and carrots for 3 minutes, stirring frequently. Add the garlic, 1 teaspoon salt, oregano, cumin and black pepper to the pot. Cook for 1 minute, stirring frequently. Add the ham shank, flank steak, pork stew meat and 1 teaspoon of salt, stir well. Cook the meat, stirring frequently for 2-3 minutes to brown the meat a little bit. Add the tomatoes to the pot and stir well. Then add 12 cups of water. I know that’s quite a bit of liquid but a lot of ingredients are going into this ajiaco soup later. In the end, you’ll have a nice thick soup full of goodness…wait for it. Raise the heat to high and bring the liquid to a boil. Lower the heat to medium-low and cover the pot. Cook the soup for 60 minutes, stirring occasionally. Once the meat is stewing, start to peel and prep the vegetables. Some of these vegetables can be a little tricky to peel. 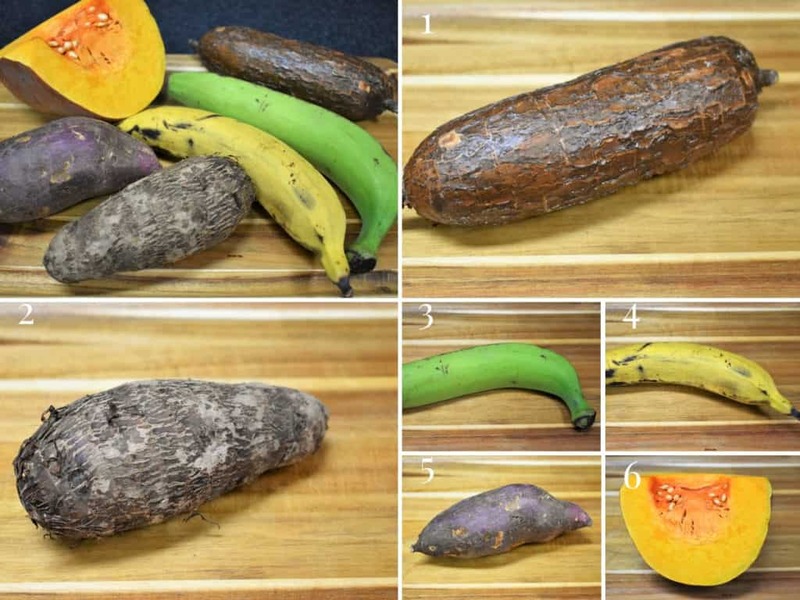 Check out this crema de malanga recipe to see how to peel a malanga. Use this same technique with the yuca. Take a look at this tostones recipe to see how to peel a plantain. And this ginger spiced pumpkin soup recipe for the pumpkin. The boniato can be peeled like a potato using a regular peeler. The vegetables are going into the soup at different times so keep that in mind while you’re doing the prep. Second batch: corn, boniato, pumpkin and the semi-ripe plantain. 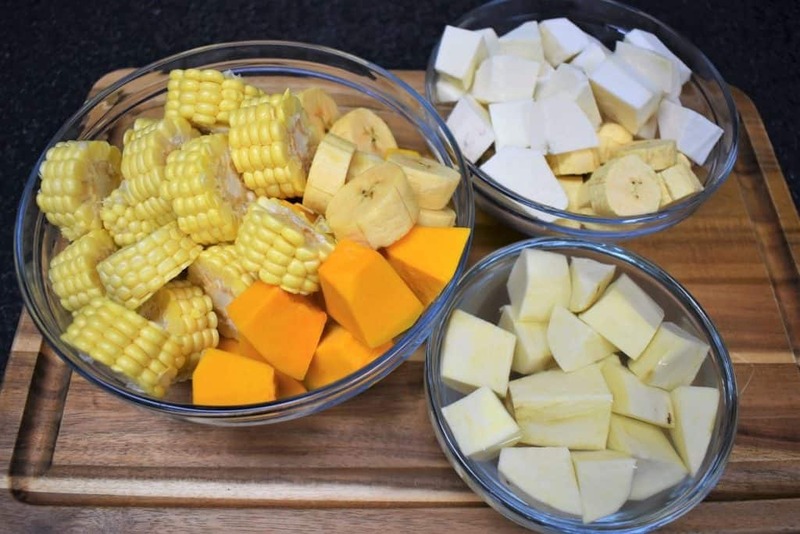 Peel and cut the green plantain, malanga and yuca first and place those together in one bowl. Keep in mind that some of these root vegetables look really similar when they’re peeled because they’re white on the inside. Then, prep the corn, boniato, pumpkin and the platano pinton (semi-ripe plantain), they will go in the second batch. Separate the vegetables in different bowls and group them. Keep the boniato in a bowl of water, like a potato, because it slows the browning process. 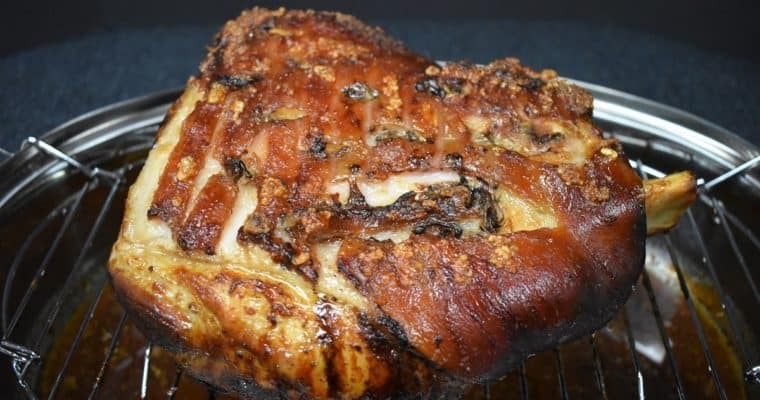 After the meat has cooked for 1 hour, remove the ham shanks from the pot and set them on a cutting board or pan. Allow the ham shanks to cool. Add the green plantains, malanga and yuca to the pot. Raise the heat to high, bring the liquid to a boil. Lower the heat to medium-low and cover the pot. Cook the soup for 30 minutes, stirring occasionally. When the ham shanks are cool enough to handle, remove the fat and the bone and discard. Chop the meat and add it back to the pot. Add the corn, boniato, pumpkin and platano pinton (semi-ripe plaintain) to the pot. Again, raise the heat to high, bring the liquid to a boil. Lower the heat to medium-low, cover the pot and cook the soup for 30 more minutes. Or, until all of the vegetables are fork tender. Taste the ajiaco and add salt to taste. Salt is always a matter of taste, not enough for me might be too much for you. To use an old adage: you can always add, but you can’t take away. So start with just a little, taste again and adjust if needed. As a reference we added 2 teaspoons of salt at the end, but did it a ½ teaspoon at a time. 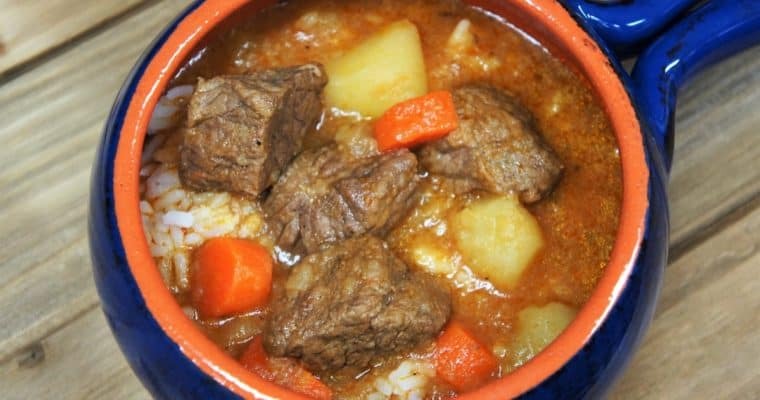 This soup is a meal in itself, so serving it with rice or a meat dish is really not need. A nice piece of crusty bread, however, is a nice addition, enjoy! 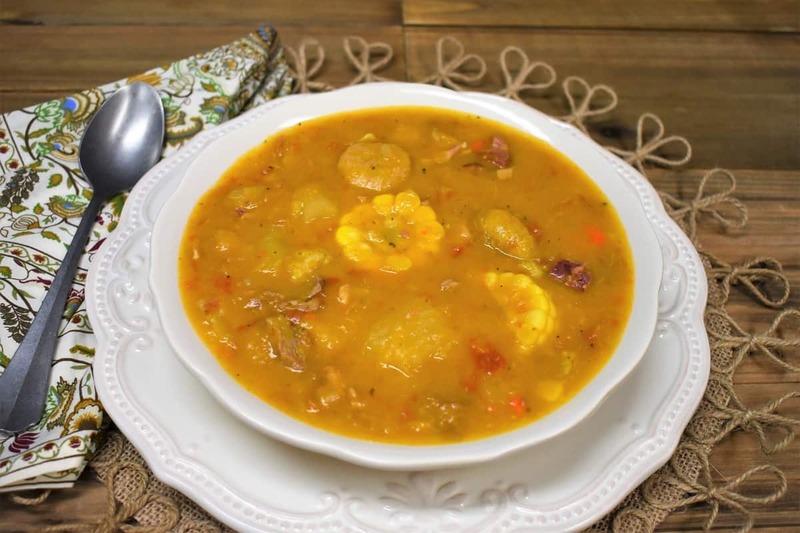 Take a look at this collection of popular Cuban Soups! 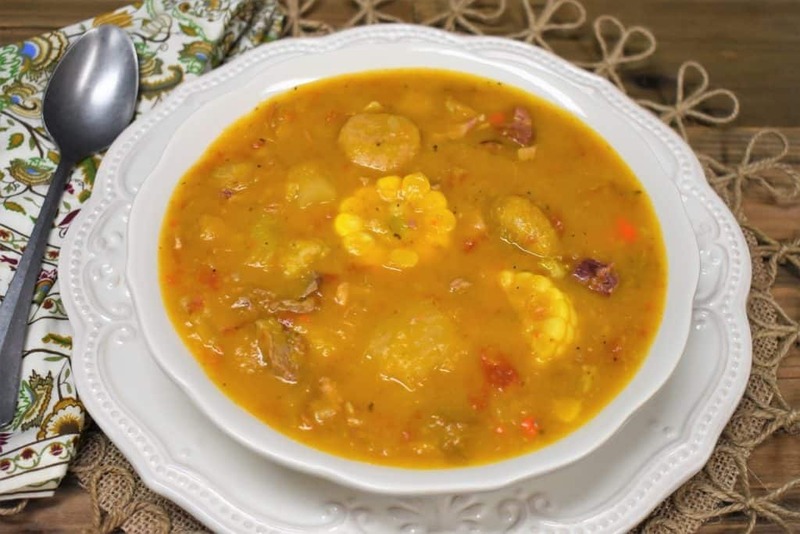 Ajiaco is a hearty soup that’s popular in Cuban cuisine. This soup includes pork and beef and a showcase of tropical vegetables. Heat the olive oil in a large, heavy bottom pot over medium heat. Add the onions and carrots to the pot. Gently cook the onions and carrots for 3 minutes, stirring frequently. Add the garlic, 1 teaspoon salt, oregano, cumin and black pepper to the pot. Cook for 1 minute, stirring frequently. 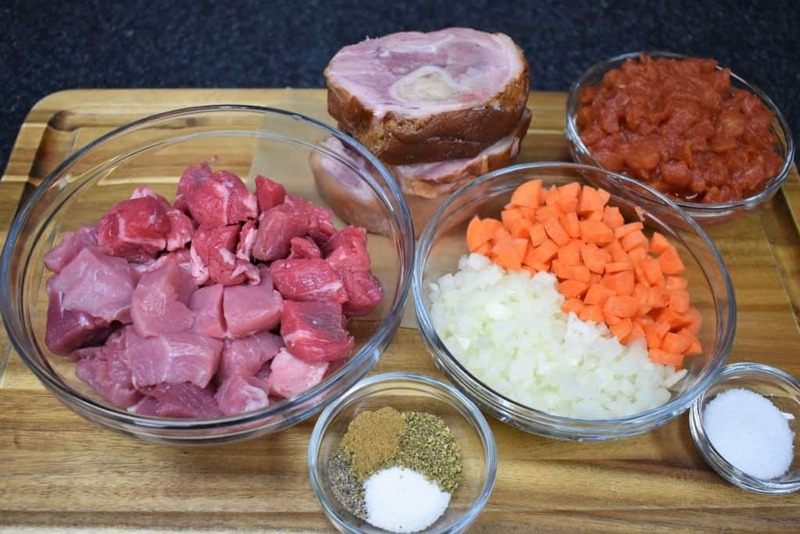 Add the ham shank, flank steak, pork stew meat and 1 teaspoon of salt, stir well. Cook the meat, stirring frequently for 2-3 minutes to brown the meat a little bit. Add the tomatoes to the pot and stir well. Add 12 cups of water. Raise the heat to high and bring the liquid to a boil. Lower the heat to medium-low and cover the pot. Cook the soup for 60 minutes, stirring occasionally. 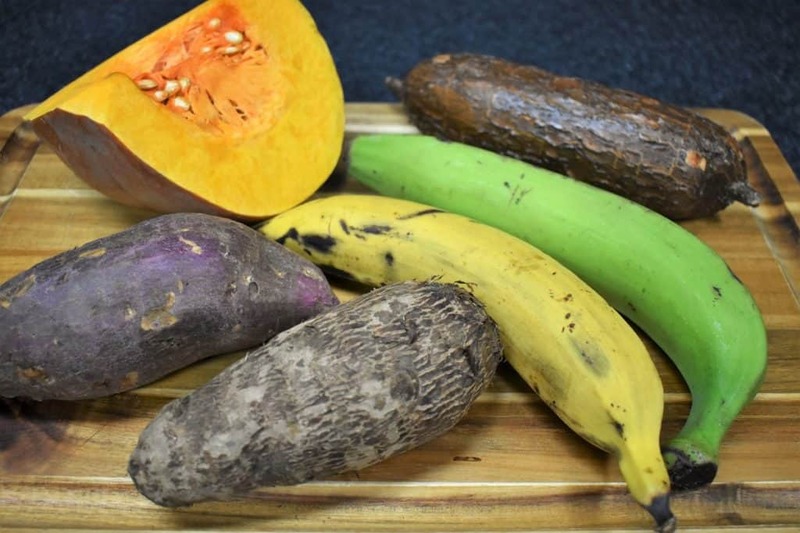 Peel and cut the green plantain, malanga and yuca first and place those together in one bowl. Prep the corn, boniato, pumpkin and the platano pinton (semi-ripe plantain), they will go in the second batch. Add the green plantains, malanga and yuca to the pot. Raise the heat to high, bring the liquid to a boil. Lower the heat to medium-low and cover the pot. Cook the soup for 30 minutes, stirring occasionally. Add the corn, boniato, pumpkin and platano pinton (semi-ripe plaintain) to the pot. Again, raise the heat to high, bring the liquid to a boil. Lower the heat to medium-low, cover the pot and cook the soup for 30 more minutes. Or, until all of the vegetables are fork tender. Taste the ajiaco and add salt to taste. They’re going into the pot in this order First batch: green plantain, malanga and yuca Second batch: corn, boniato, pumpkin and the semi-ripe plantain. Then, prep the corn, boniato, pumpkin and the platano pinto (semi-ripe plantain), they will go in as the second batch. Separate the vegetables in different bowls and group them. Keep the boniato in a bowl of water, like a potato, because it slows the browning process.